Mare's tails? Mare's nest? I dunno. Vapour trails, probably. Has anyone been ‘upgraded’ to the all-new BT Mail service recently? Have you yet torn out all your hair or smashed yourself in the teeth? But no. I had a call from a nice man in Mumbai, who unfortunately had clearly never seen this system before. He took over my screen and clicked around all over the place, checking all the settings I’d already (obvs) checked, before informing me that ‘this function is not supported by the new BT Mail’. I fumed for a bit, and muttered about switching to gmail. (This may yet happen, those of you who have my email address, watch this space…) Then I clicked on to Blogger (another Google ‘service’), to find that my dashboard can now only show one post at a time from my so-called Reading List. I’ve been away, so hadn’t noticed this, but apparently the problem has existed for at least a week; hundreds of people have complained, and been exhorted to be patient. Send me an email, drop me a line, stating point of view. Jackson’s, a legendary department store in the centre of Reading, finally closed down last Christmas Eve, after 140 years of selling school uniforms and sensible underwear and imitation Dresden knick-knacks, and of being as iconic a landmark in Reading as, say, Selfridge’s in Oxford Street or Lewis’s in Leeds. Plans have just been unveiled to preserve the façade, whilst installing flats* and, yes, shops, behind it. I think I shopped there three times. Once for an unlined cream linen jacket (which I wore for many years) and a panama hat (I must have been going through some kind of Somerset Maugham phase), and twice for presents for elderly aunts. 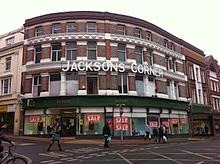 Jackson’s was the go-to place for presents for elderly aunts. So I can’t say I’ll miss it as a shop – but I think I will as a symbol. A symbol of what? Well, walk into T. P. Hughes, Pettits, or Ocky White’s, to take three examples I am (or was) familiar with, and you’ll be uniquely in Tenby, Wallingford or Haverfordwest: those shops are (or were**) intrinsic to the town where they were born and grew up. Walk into John Lewis, Debenhams or House of Fraser, and you could be anywhere. This is not to denigrate the big chains, just to say that something special is being lost. Crankiness, quirkiness, localism, call it what you will. I kind of wish I’d shopped in Jackson’s more. In Bournemouth, where I was born and grew up, there were four big department stores, all very different. Bobby’s turned into Debenhams, while Plummers also briefly became Debenhams (until Debenhams decided they couldn’t sustain two stores in the same town and closed it down). The surviving Debenhams has recently been rebadged as ‘Bobby’s, though I doubt if the clock has been turned back to the fifties. Brights is House of Fraser. Only Beales survives. The last time I was in there, ten years ago, it hadn’t changed much. I bought a wallet, which I’m still using. I was once told that you could identify a good town by the presence of a pet shop, an old-fashioned ironmongers’ and a second-hand bookshop. Any candidates? * Some of which will, apparently, be ‘affordable’, as opposed to the other sort – but that’s another debate. ** Ocky’s closed down in 2013. I can’t say I regret the shop, only went there once, but I do rather regret the name. ‘Eugene Goostman’, either a dysfunctional Ukrainian teenage boy or a computer-generated simulacrum, has, it’s claimed, passed the Turing test, by fooling a third of a panel of judges into believing that he (it) is the former. There’s evidence that Alan Turing wasn’t being entirely serious when he proposed this test. But, having read a few of Eugene’s conversations (google them yourselves), I can only assume either that the judges weren’t being entirely serious either, or that they all exclusively inhabit the twitterverse – where that sort of gubbish is entirely normal. I propose an updated Turing test: ask Eugene to write a blog. That’ll sort out the brains from the bots. I've been having a clear-out, and came across a pile of old notebooks. In one of them, I stumbled across the following, written almost exactly twenty years ago. I've only changed a few words. Down the drain of tomorrow’s good ideas. Where’s the spirit of the War? When I was looking after Mum? Was there a reason for the War? And thinks about his best friend. Ready for the next game.